Prerana which means, ‘sublime inspiration’, was founded by Indira and Maj Varma and opened its doors in 2001. Beginning in 1996 with a successful mainstream school, Mount Banjara High School, the stresses and divisively competitive nature of mainstream education led Indira on a quest for a truly human education which nurtured and protected the sanctity of childhood. When she encountered the work of Rudolf Steiner and Waldorf education, she found answers to her many questions for here was an education which taught to the whole human being, encouraged greater social and moral responsibility, and allowed young children to be children rather than forcing them into an accelerated intellectualism. Prerana began as a kindergarten and nursery, and grew along with the children, developing into a thriving grade school, advancing one grade each year. The school relocated from Banjara Hills into our own building in Gachibowli, and has grown into a dynamic community serving children up to Grade XII. We meet all CBSE board requirements for KG through Grade XII and use Waldorf methodology up to Grade VIII. 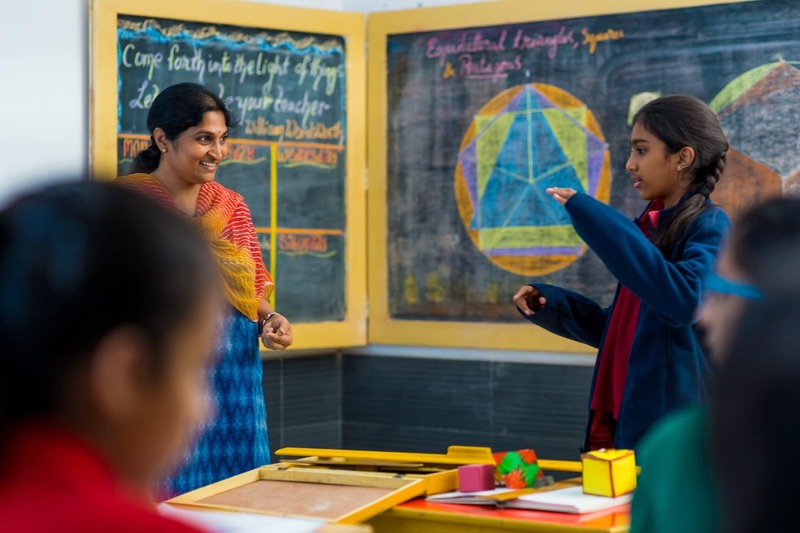 Hyderabad has become something of an oasis for Waldorf education for there are now four full fledged Waldorf Schools; Prerana, Diksha, Abhaya, and Sloka, as well as several developing initiatives. 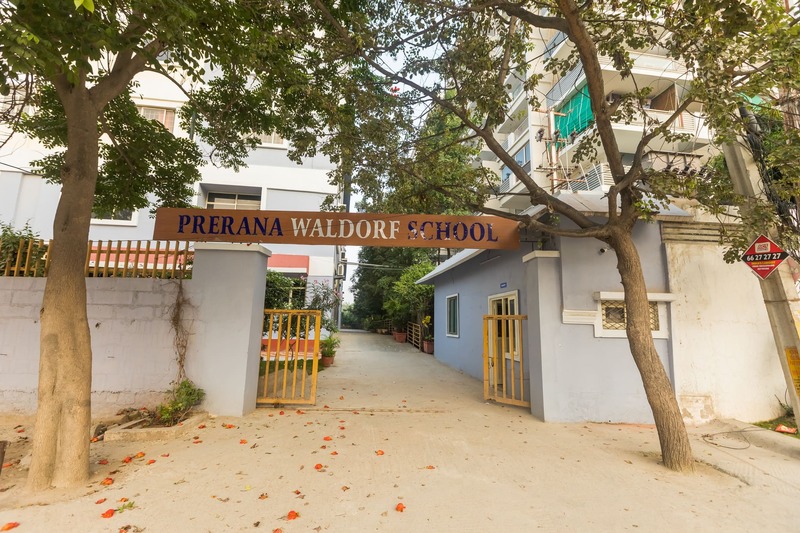 The mission of The Prerana Waldorf School has at its root a social impulse for working with children ages 3 to 16 based on healthy human development and a commitment to protect and nurture childhood as the very foundation of a truly human culture. We are committed to the ideals and practices of Waldorf education which genuinely respects the dignity of childhood and a socially inclusive understanding of human individuality. We recognize that free creative play, imitation, exploration of the social and natural worlds, practical and meaningful work, artistic activities, and nourishing sensory experiences are essential to the development of the young child. Through our programs and activities, we offer children a comprehensive and rhythmic experience of each day, week, and season of the year. We strive for diversity and inclusivity with regards to the social, cultural, religious, and socio-economic backgrounds of the families and children who are a part of our school community. Likewise, we strive to meet the varying and unique developmental needs, capacities, and cultural backgrounds of each and every child. Our curriculum, from early childhood through high school strives to inspire students through a program of rigorous academics, diverse artistic activities, physical and outdoor education, leading them towards clarity in their thinking, sensitivity in their feeling, and meaningful purpose in their actions. We recognize that well balanced child development is possible only within the context of a community of consciously striving individuals committed to healthy social relationships between parents, teachers, and children. The partnership of parents and teachers nourishes the well being of all members of our community, adults and children alike. It is our intention to build such a community based upon mutual respect, compassion, and tolerance, inclusive and embracing of our social and cultural diversity. Our faculty and staff are qualified and responsible professionals by virtue of their education, experience, and on-going commitment to continuing education and professional development. Teachers have formal training and education in the methods and practices of Waldorf education, as well as meeting all State requirements and are actively engaged in deepening their understanding of the curriculum through collegial work, individual study and artistic activities. We support the professional development of our teachers through regular mentoring, peer partnerships, review, and evaluation as well as providing opportunities for them to attend conferences, training courses and workshops. The professionalism and commitment of our teachers is clearly reflected in the respect and concern they show towards the children, their families, and society as a whole.